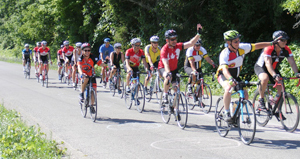 Come and explore picturesque backroads and quaint villages as you cycle with over 800 cyclists throughout Norfolk County, Ontario. All routes are on quiet, paved roads. The start/finish is in Delhi, Ontaro. 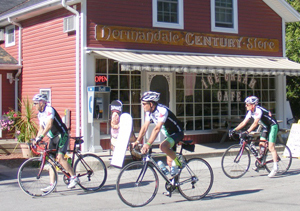 Choose from 40, 75, 100 and 160 km routes with rest stops every 20-25 km, complete with snacks and refreshments. After the ride enjoy a delicious spaghetti lunch and ice cream. Cool off in the outdoor pool. Norfolk County is located in Southern Ontario on the north shore of Lake Erie. Known as Ontario's Garden, Norfolk farmers grow a variety of fruits and vegetables, as well as ginseng, lavender and tobacco. The area is quite flat with quiet, paved roads. Norfolk County is also known for its beautiful sandy beaches and marinas along the shores of Lake Erie.